In November 2002, when Mufti Mohammad Sayeed assumed power after a long political wait and became chief minister, the first thing he did was to bulldoze Pampore, a township on the edge of Srinagar city which is known for its saffron fields. The large scale demolition was done without any ‘planning or roadmap’. Locals felt it was a political move to settle scores with a place that has historically stood strong with Mufti’s political rival National Conference (NC). Twelve years have passed since first shop was demolished but nothing has changed in this highway town. One can still see the signs of demolished houses, shops, open sewers, half razed structures, dot the narrow highway that passes through this town, which Mufti regime vowed to widen after demolition. But no road was constructed. No one even bothered to clear the debris left behind by the bulldozers. “It was just to settle scores. There was no other reason,” said Mohammad Yousuf Malik, 60, spokesperson of Falah-e-Behbood Committee, Pampore. Before militancy broke out in Kashmir in 1989 Pampore was a NC stronghold. 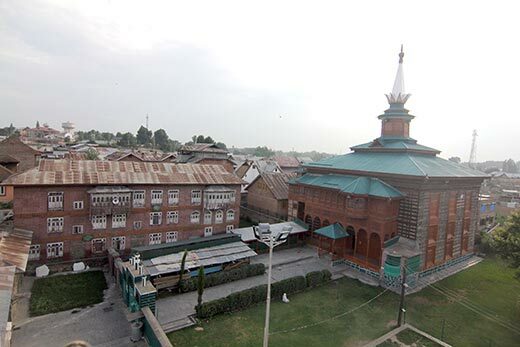 Locals believe that the reason, Mufti demobilised 80 per cent of main market, three days before biggest Muslim festival Eid, was to avenge lifelong insults that people of this town hurled at him whenever he passed through. “That (demolition) was the first thing that Mufti government did. He must have smiled to see people of Pampore mourn before Eid,” says Mohammad Ehsan, a local whose house was partially demolished during Mufti government. But equations completely changed once militancy broke out in this picturesque town. It was completely engulfed. During 1996 state assembly elections, militants placed a coffin in the middle of highway, with an edict that read: whosoever votes first will get this! There were less than 2 per cent votes polled in main town Pampore. This was the start of the boycott era and, also, the shift of vote base from Pampore town to adjoining villages. The town that has till 1987 elections stood strongly with NC, was by 1996 polls mourning its loved ones killed during numerous cross-firing incidents, that happened on the highway. There was complete boycott in main town Pampore despite the fact that government sponsored renegade Papa Kishtwari was unleashed to make sure peoples’ participation. 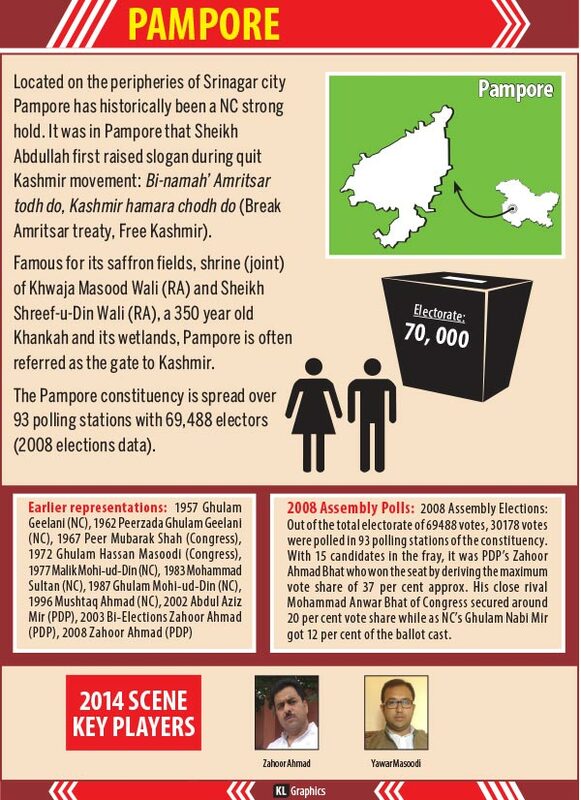 The end of NC’s dominance in Pampore started after it fielded a less popular and inexperienced Mushtaq Ahmad Kuchay for the second time in 2002 against PDP’s fresh face Abdul Aziz Mir. Mushtaq’s six year representation (from 1996-2002) was marked by corruption, inefficiency, favouritism, disconnect. Mushtaq stood third, while Mohammad Anwar Bhat of Indian National Congress (INC) lost by a margin of just 704 votes. But within two months of Aziz Mir’s victory he was gunned down by ‘unidentified’ men outside a mosque in his native village Konibal. Riding on the popular sentiment and support of natives Mir’s son Zahoor Ahmad Mir contested the 2003 by-elections and won comfortably by bagging 14317 votes against rival Mushtaq Ahmad’s meagre 1535 votes. Since then Zahoor is contesting successfully from Pampore. However, in 2008 elections it was again INC’s Mohammad Anwar Bhat who stood second with 5969 votes against Zahoor Mir’s 11117 votes. People believe that it was NC leadership’s arrogance that cost them Pampore. “They (NC leadership) always took decision in closed rooms. They never bothered to listen to their workers who had given their blood and sweat for the party,” said a former NC worker who wished not to be named. “First they denied party loyalist Abdul Aziz Mir (Zahoor’s slain father) a ticket who later joined PDP and won, then they fielded a corrupt Mushtaq Kuchay, and finally an illiterate Ghulam Nabi Mir. This is how NC treated Pampore,” says Bilal Ahmad Wani, a former NC worker who switched his loyalties after senior Zahoor Mir’s father was denied a ticket. “The final nail in NC’s coffin in Pampore was when they fielded Ghulam Nabi Mir, a retired forest guard, in 2006 elections. He was a political novice who knew nothing about the place and people,” says Malik. With NC’s Mushtaq out of political scene and INC’s Anwar Bhat struggling to put an impressive show since his debut in 1996 elections, the turf seems to be open for PDP’s Zahoor Ahmad Mir. But there is a small twist in the tale this time around. Last year NC’s patron Farooq Abdullah, during a public rally, informally declared serving high court judge justice Hasnain Masoodi’s son Yawar Masoodi as party’s candidate from Pampore. Yawar, who lives in a plush accommodation in Sanat Nagar, originally belongs to Khrew area of Pampore. “It is NC’s last attempt to consolidate voters living in villages. They are trying to hit at Mir’s vote base,” says Ghulam Nabi Bhat, a school teacher familiar with local politics. Yawar, whose candidature is not official yet, is already in touch with party workers since Farooq Abdullah’s informal announcement last year. “I want to focus on development. Being a youngster I can relate to problems faced by youngsters properly,” says Yawar whose rival Zahoor enjoys the status of being one of the youngest elected members till date. Ask him what are the immediate issues that he thinks need to be addressed if voted to power and he will pause for a while and shoot back: there is a pressing demand for a sports facility in Pampore, a transparent system of saffron prices control, beautification of areas along the highway etc. The first one, a sports ground in Kadalbal, Pampore is an emotional issue for locals. One can see a garland made of old and worn out shoes decorating inauguration stone with former sports minister, RS Chib’s name on it. “It has been almost a decade now since we are asking officials to help us improve this stadium. But nobody seems to bother as this is in the main-town Pampore and people do not vote here,” says Muzaffar Ahmad, 25, a local sportsperson and a shopkeeper by profession. “I am personally going from one official to another with documents regarding this stadium. I know it’s an emotional issue for locals,” says Yawar. “It was because of my efforts that they (officials) have started the work,” claims Yawar. “I gave Rs 27 lakh from my constituency development fund for the development of that stadium at Kadalbal, for which now NC is trying to take credit,” says Zahoor. Zahoor’s disconnect with main town Pampore and his strong connection with villages surrounding it has literally divided the constituency on rural-urban lines, says Nazir Ahamd, a local activist. Since his first victory in 2003, it is blamed that Zahoor has hardly visited main town Pampore. “How can he understand our issues when he has not been here at all,” asks Nazir angrily. It is now villages versus town in Pampore constituency, feels Tariq Ali, a former NC worker who left politics after militancy broke out in 1989. “I know there is a strong sentiment in main-town against a village based representative like me. But for me every citizen is equal. I do not differentiate on these lines,” says Zahoor Ahmad Mir, PDP MLA from Pampore. “Since first election all representatives in Pampore were from main-town who neglected villages completely. I am just giving them (villagers) some voice,” says Zahoor. Since his first victory in 2003, Zahoor says that he has been visiting the main-town regularly, despite the fact that he does not get a single vote from the area. “I understand that there is resentment among people against demolition driver that Mufti Sahab undertook across Kashmir against illegal structures in order to widen the congested road network,” says Zahoor. “But we compensated every single person who was affected by the demolition. I oversaw construction of 126 shops at Tanchibagh, which were then handed over to the affected people for just Rs 38,000 a shop,” claims Zahoor. On the other hand Yawar feels that people cannot be fooled by mere propaganda. “PDP has ruled so far by means of division. I want to take everybody along. Why to fight over village and town. Our concern should be development only,” feels Yawar.